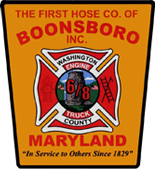 The always popular "Good Friday Cash Bingo" will be held Friday April 19, 2019 at the Boonsboro Fire Hall, 5 St. Paul St., Boonsboro, Md.Tickets are only $25 for 20 games, and are available at the door. Doors open at 5 pm, with games starting at 6:30 pm. There will be good food and drinks available for purchase, as well as Tip Jars, and a 50/50 drawing. If you would like to reserve a seat or seats, contact Jessie - (240) 313-5454, or Kim - (240) 315-1660.